This is plate 10 from 'Sketches in Afghaunistan' by James Atkinson. The Army of the Indus had to conquer the lofty passes of some of the world's most rugged and inhospitable terrain as they entered Afghanistan. 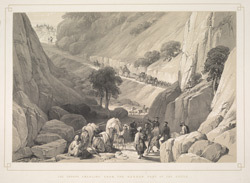 They journeyed through the Khojak Pass between Quetta and Kandahar in three stages, all of which Atkinson sketched. He presents the army emerging from the narrow defile into the pass. He wrote: "The road up to the defile had gradually increased in steepness, and diminished in width, and the ascent became more difficult. The tediousness of the march may, therefore, be easily conceived. The old path to the left, was so steep as to be quite impracticable for the purpose of ascent, and in consequence, taking a wide sweep, another was cut, less abrupt, upon the brow of the hill, as seen to the right of the drawing."